Click here see the Gallery of recent work for sale. This page is my web journal following my creative process with painting silk and taking it to a commercial fine arts sales level. Finally got business tax number, and Feel Official! Took Joy-Lily's summer session silk painting class in SSF - 5 weeks of 3 hours of studio time with lots of elbow room in good company - what's not to love? Producing in batches, working towards applying to do the Castro Street Fair this coming October. Thom called and ordered another six scarves for his Good Earth Gallery. Visiting Philadelphia with Lise for ALA, walked into a little gallery just south of the convention center and got to talking; brought in silks the next day and he bought six to display! First Art Fair with the silks, including some eye-mask pillows we made and stuffed with flax seed, some including lavendar and one with lemon verbena from the garden that Lise has been drying. Mmmm wonderful things. Sold the fabulous touchstone blue piece in the photo from 11-12, and the green chiffon-satin edged piece, and took orders for three other colors in that scarf style; sold some of the pillows, a card (I made a few); and several little handbound (with silk) post-it notes book covers, an idea adapted from Mary Beth Shaw, who does the form with pieces and papers from her wonderful collage-work. 11-08-2002 On Joy-Lily's recommendation, I wandered out to SCRAP, the Scroungers' Resource for Art Parts, and found some delightful art materials at this all-by-donation recycled art and what-all nonprofit, including a beautiful piece of galvanized stove-piping for making a silk steamer that can go in my kettle on the stove! Sing hurrah for Good Tools Found Cheap. 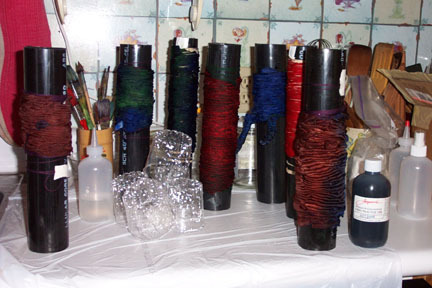 I also swung by the Orchard Supply Hardware and bought a bunch more of the PVC pipe I use for the cores of my arashi shibori. There are now several in different diameters, in addition to another handful of my 'core' 2.5" diameter favorites. Pulled the tax forms for starting a biz in California, from the various governmental sites online. A quick call to the planning department confirmed that perpetrating art and making a mainly mail order and wholesale business in my home is fine with zoning (as long as I don't hang a big old neon sign, or take more than a quarter of the floor-space for the business - we had a good laugh over that!) Sole Prop, just like the graphic design side of my life; and a California Resale number; check. Do I need any kind of permits within the City-and-County? What an amazing list of oddball licenses there are - to throw a Masked Ball requires a $147 license, who knew?... looks like there's something regarding dyes under the permits handled by the health dept. I think I can handle a $15 annual fee for these nontoxics, if it applies. Onward! 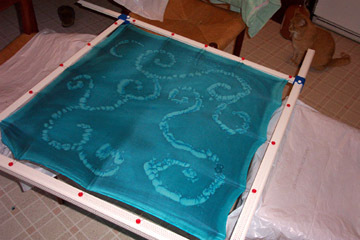 So this day's painting has been all about arashi shibori, and you can read about that, and see some really impressive pieces, over at one my my favorite mentors, DJ Hamouris' website So here's today's work-in-progress. It's busy drying now, then it gets heat-set, and after a few days of really settling in, I'll rinse it out. Salt spirals on Marine-Green silk, 35" square, 10-13-2002. I brushed the marine green jacquard onto wet stretched silk (note the nifty stretcher frame dear Anise has long-term loaned me out of the blue upon hearing that I'm painting again! bless her...) and salted carefully with sea-salt (medium size grain, about halfway between table salt and the bigger chunks of Kosher pickling salt), and also used table salt for many of the spirals. It only looks like kitty Isabella is intrigued, she's staring *pointedly* at her supper dish, and who can blame her? Fascinating what the edges did, lightening up like that. These silks have been prewashed, but I wonder if there was anything in the thread or the rolled edges to make it lighten up like that, coming in from the sides. It's even, in any case, and I like it. My mother, Mary Temple, is a weaver and a fiber artist, and was one of the founders of the Weavers Guild of Minnesota. Having grown up with a low-level current of color, design theory and commitment to the arts, it is no wonder I find myself drawn again and again into the creative sphere. I have become fascinated with surface design, specifically silk painting techniques as they are being explored currently in northern California. 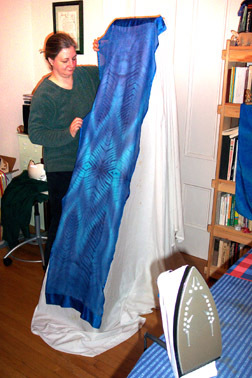 Joy-Lily is a splendid and down-to-Earth inventive silk painter and a fabulous teacher of these associated arts. DJ and I are both taking her Fall 2002 class in silk painting at the South San Francisco Senior Center, which is a lovely semi-structured studio time on Tuesday mornings...ah, elbow room is a lovely thing. A room full of folks trying out New Things is very fun. Dharma Trading Co has been at the business of making cloth (especially clothing) colorful for a few decades now, and have a great sense of humor, lots of information on their homegrown website & in their catalog, and have, as well as the Good Dyes, a huge selection of ready-to-dye clothing that's worth just going and perusing.